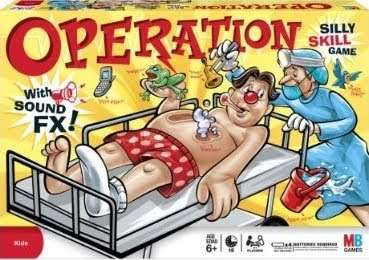 As a woman very interested in health and medicine, the game Operation always fascinated me, and I have always wanted to play (but had never gotten the chance...until now). What an awesome game to teach *very* fine motor skills, and I am absolutely terrible at not hitting the sides. So this newer version of Operation now has sound effects, too! (Bells, barks, burps, toilet flushing, etc.) Also, instead of having cards and money, the game itself tells players which part should be removed next. Yay for fewer pieces to lose! For a game that has a lot of tiny pieces, I think it's awesome that they got rid of some of them. For the rest of the pieces there's a clipboard and storage tray to keep things together. 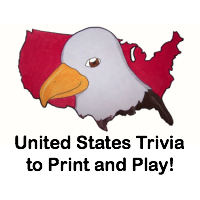 I also love how there are two different skill levels and you can play with one or more players (ages 6 and up). Here's the scoop on how to play. Take the tweezers and "operate" on Cavity Sam (hehe). The game itself tells you which part you need to remove, and you press his nose when you're finished to see if you were successful. At the end, the best "doctor" wins! This giveaway will close on May 5, 2010 at midnight. okay, doing this again, since i did it wrong in the first place. I'm on your hi-ho cheery-o giveaway. I follow and I like my lips. I follow on GFC; I think my favorite body part is my hands. I use them to create, to touch my bebe's faces in love, to communicate in bloggy land..I'd be lost without them! Well, since I have to keep my mind out of the gutter ;) I'd say my favorite body part are eyes. I voted for you via the Top Mommy Blogger button! I like my nose - and I follow on GFC! I entered the Cootie giveaway!